Mayan Name: AJPUU / Ahau. Meaning: Sun, Flower, Light Lord. Compatibility: Sun, Lizard, Star, Road, Vulture. According to the Mayan horoscope, Ahau - the Sun sign has the ability to attract attention. A bright, unordinary personality evokes a keen interest of the surrounding people. Cheerfulness, sociability, activity are qualities of a person capable of captivating his ideas. The representative of the Mayan sign is an excellent organizer, able to rally around like-minded people around him. Has a great sense of humor, knows how to avoid embarrassing moments, is considered the soul of the company. With all his complacency, he is quick-tempered and irritable. It draws attention with its inner strength, while it can get confused, faced with minor problems in his personal life. Careers people sign Sun is developing successfully, they manage to find the best application for their numerous talents. With their inherent activity they begin to solve complex cases. Quickly find a common language with a variety of people, show a sincere interest in their problems and deeds. Sharp mind, calmness and endurance are qualities that allow you to dignify out of difficult situations with dignity. Therefore, from the representatives of the Sun sign, good, just leaders are obtained. Nature generously endowed them with talents and exceptional capacity for work. The world knows a lot of famous people of this day — the ministers of the muses: actors, dancers, writers, poets, artists. In love relationships, the people of the Sun sign show their best qualities, literally dissolve in the chosen one. Love to arrange surprises, try to paint the life of a loved one with vivid emotions. They become so attached to their partner that they do not think of life without it. For all its openness, cheerfulness easily lose the ground under your feet, so the horoscope of compatibility they are suitable for strong people who are able to take on the solution of all problems. In return, they are ready to give tenderness and care. Love for the representatives of this day is a source of inspiration and vitality. 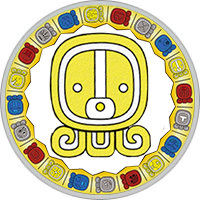 The Maya horoscope characterizes the man of the Sun sign as a person with a complex character. For all his radiantness, openness, he is prone to bursts of rage, which he does not deem it necessary to hide. He does not like to listen to criticism, he considers himself right in all situations. He wants to recognize and compliment, sincerely rejoices. Moreover, it has a mass of merits that deserve high praise: kindness, honesty, decency. He always keeps his word, fulfills his obligations, but he will not give up the help of a close person, offered in tactful form. Light-minded woman of the Sun sign seems the most cheerful and carefree being on the whole planet. Bright, cheerful beauty excites the hearts of men. He likes to be in the center of attention, surrounded by loyal fans and faithful friends. With the representative of this sign it is interesting to communicate, it’s impossible to take offense at absurd behavior, so other women appreciate and appreciate it. The horoscope of compatibility will find happiness in alliance with a strong, confident man who can tolerate her small weaknesses: waste of money, coquetry.